More evidence of Hawksmoor’s increasing popularity with Independent Financial Advisers (IFAs) has emerged in the form of an article in Citywire publication New Model Adviser. 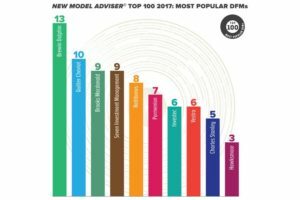 The magazine surveyed the IFA firms in their annual ‘New Model Adviser Top 100’ list to find out how many outsourced to a Discretionary Fund Manager (45 of the 100) – and which Discretionary Fund Managers were the most popular. Hawksmoor appeared in the Top 10 of this list for the first time – a great indication of the increasing popularity of our Discretionary Portfolio Management Service among IFAs. Read the full New Model Adviser article here.